Updates from the National Retail Federation Big Show 2015. NRF’s Big Show 2015 was many things. Part of our ChainLink team divided but still could not conquer or cover the whole show. (Read Scot Stelter’s NRF wrap-up on RFID and Bill McBeath’s Retail Solutions Throughout the Maturity Cycle in this issue.) This article looks at some supply chain innovations and innovators. The planning, procuring , building, moving and storing, and service resources necessary to fulfill product demand. 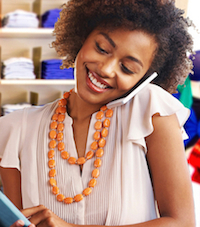 In the last year, retailers’ talk about Omni-channel has moved to action. Although Omni-channel is really not a new concept, the need for defining and attaining excellence is new, as consumers are bombarded by marketing, promotions, and promises1 that the object of their desire can be had from any channel they choose. Promises are easy to make, but those promises have to be fulfilled. Thus the role of the supply chain in Omni-channel. In the chart at right, I have attempted to define supply chain for today’s retailer since, often, when I use the word supply chain, retailers think inbound logistics. Let’s take some simple everyday scenarios—a composite of many of the presentations and talks we had with retailers and solutions providers during the three-day extravaganza. Grocery provides us with good examples because everyone can relate to the time sensitivity of events—the daily occurrence of eating, stocking inventory, selling, and filling the displays with fresh food. Event planning—the event. Our local team is 7-0. We are on our way to the playoffs and this game will decide our fate. The guys want to get together at Chuck’s house to watch the big game. All across our town, living rooms are illuminated with the glow of the large HD TVs with so many sports—basketball, hockey, football, international skiing, and golf, and so on. But tonight will be big. Everyone is ready to watch the big game and party. Platters, pizzas, chips and beer. And if our team wins we want streamers, balloons, and party stuff in our team colors. But the supply chain question is: Will the grocer be ready for everyone? Worst case scenario: Not only does inventory run out, but the plan to put in a few extra workers that weekend—to stock shelves, prepare orders and do home deliveries—was never done. Stock-outs and frustrating lines at checkouts are a warning indicator of customer loyalty erosion next week as ‘our team’ continues its journey to the playoffs. Click and Collect—Looks like I’ll be working a bit later today and won’t have time to shop for dinner and groceries. No matter, I can buy online and pick up in the store on the way home. The website has all the SKUs from the grocery chain. But the questions are: Do they really have the goods at my store? Will they have the food packed and ready to go at the promised time? The truth is that retailers are often failing at these simple scenarios. Managers are fairly good at managing their warehouses and retail space as long as there are no surprises. However, with the proliferation of Omni-channel orders, the time between demand and the supply—the fulfillment window—has shortened considerably and the data from those diverse channels is not compiled, analyzed and shared so that the managers can be prepared. Any unplanned event can throw the well-tread processes out of kilter. Store managers, as well, are not yet ready—mentally and physically—to turn their stores into online fulfillment centers. Yet to do so is a business decision being made at the corporate level by more and more retailers. For example, Macy’s has declared their click and collect will be about $1B in 2015. So the systems and processes have to be able to support that. The problem is vast and the range of retailers from small to large across many categories means there is room for innovation and many solution players. Let’s look at a few interesting solution providers and some of the areas they are focusing on. From talking to these and many other providers, we learned about several solutions—and gained some great insights into what’s happening in Omni-channel. SalesWarp—Clad in white doctor’s coats, they call themselves the doctors’ Omni-channel. But humor aside, they already boast several retailers as customers. A young company emerging from warehouse, they offer a range of integrated capabilities to help SMB retailers perform at peak levels. SalesWarp looks at Omni-channel inventory/warehouse managing from outbound shipping through returns. Returns are a huge source of consumer dissatisfaction if not handled well. How do returns fit into Omni-channel? Many retailers cannot handle a return in one channel that was purchased in another. Insight: Include returns in your Omni-channel strategy. Reflexis—Workforce management is one of the biggest challenges retailers have2—from the warehouse to the store and into the home. With so much of Omni-channel investments focused on new websites, the store team is often forgotten. Reflexis, however, has not forgotten, boasting over 80% market share in the workforce planning and labor management sector. The goal is to align the workforce to demand—having the right skill at the right place and time. This results in increased sales, which improves the operating efficiency of a retailer.3 Retailers are able to effectively address those event spikes and promotions as well as yield more sales day to day. Insight: When planning, don’t forget your workforce. JDA—Always a strong player in supply chain, JDA’s portfolio spans from shopper to supplier. JDA is messaging something they call lntelligent Fulfillment. As they pointed out, most organizations still manage in silos in spite of the anti-silo rhetoric of the last decade, as well as the fact that solutions providers have been offering integrated suites for a decade. JDA blends planning and execution as well as manager and worker into a holistic framework to ensure responsiveness to dynamic customer demand, optimizing inventory presence for a specific location of a customer’s choice. Insight: Integrate warehouse with transportation. LogFire—As the leading cloud warehouse and order fulfillment solution provider, boasting large and small customers across North and South America, LogFire extends the reach of the retail shelf. In essence, in an Omni-channel world, isn’t every stocking location a retail shelf? Integrating the information from all sources—factory, shelf, and ASN data of goods in transit—LogFire provides multi-site, multi-partner processes which are enabled by their cloud platform. Insight: Omni-channel requires all-node inventory accuracy. Checkpoint Systems—Known for their RFID and EAS technology, Checkpoint (as well as other RFID vendors) is venturing further into the software world. They are building out an inbound Omni-channel ‘item catcher’ (my terminology) to ensure the reserve on inventory for customer orders. For example, while products are en route to the store from the DC, online orders may be placed against some of the items in those shipments. As product is received, the systems will notify the stock clerk that there is a web order, to avoiding placing that item on sale in the store. The reserved items can be shipped or picked up by the consumer depending on the selected fulfillment method. Insights: Integrate receiving instructions to reduce labor and ensure that you meet the customer’s preferred channel for fulfillment. Insight: Hybrid models such as wholesale/retail can leverage many of the capabilities usually considered only B2B or B2C. SAP—Known for a rich portfolio of solutions, SAP has taken serious steps in the last year to provide a holistic solution for retailers, especially those that have hybrid modules such as wholesale/retail. One of the obvious issues SAP is tackling is their complex portfolio of unique solutions. 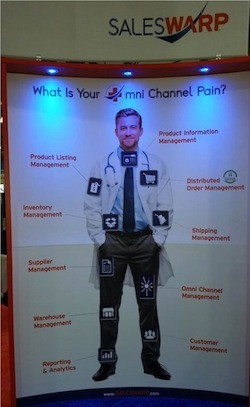 For Omni-channel they stated that inventory is a ‘horizontal’ that feeds into many verticals or channels. Inventory can be made available to the chosen channel rather than needing too many separate systems. Thus SAP has now blended their retail solution with something they call CAR—the Customer Activity Repository. This repository collects multi-channel/process data for POS, sales, channel inventory, on-shelf. This allows SAP to not only create that unified or horizontal view of inventory, but create a Unified Demand Forecast. This type of approach is useful for brand manufacturers as well as the wholesale/retail enterprise. Insight: Inventory access and the accounting between nodes needs to be considered, especially across channel partners and international shipping. Designing an Omni strategy and determining fulfillment models is important, but merchandise and inventory management still reigns supreme for retailers. Understanding customers and their requirements and then getting the right inventory levels to the right location at the right time is still the biggest challenge retailers have. The sheer scale of the problem makes it impossible for humans to manage this without good systems that have both analytic power and are easy to use. We saw a lot of investments come to fruition from merchandise/demand planning providers this year. Logility—A few months back, Logility acquired MID Retail, and they have not only absorbed merchandise and allocations into their Voyager suite, but have enhanced the solutions. Allocation is one area of tremendous additional development. Allocation can no longer be a static fixed plan, but must be responsive to actual sales. Richer rule sets and integration to more frequent data are required. B2B and B2C users can develop rules to look at a variety of criteria to understand when to allocate inventory. Rules can be chain-wide7 and/or by category, seasons, promotions, store locations or formats, demographic attributes, and so on. JustEnough—Just Enough is rapidly, organically developing new capabilities for brands and retailers. Recently they brought together previously silo'd processes that needed better integration: Location Planning and Inventory Allocation. The idea is to build a profile of the location—store size, format and planogram, demographics and so on—and then group it with other locations with like attributes. This creates an automated allocation system for these like-locations in order to facilitate planning across a chain, as well as ensure that at the detail level, shelf8 allocation can be done. 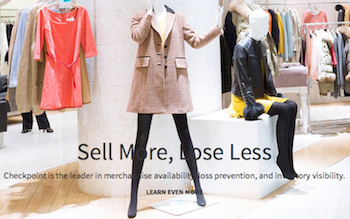 JustEnough has a new approach for implementation, something they call Merchandise Essentials. This provides a playbook for understanding the decisions users have to make to manage Merchandise Financial Planning, with methods to roll out the solution. They will also develop Essentials for other processes and toolsets over time to assist users with their demand management functions. Websites are pretty good at tracking the digital customer. But as shoppers hop from channel to channel most retailers are not keeping up.9 The store is a vast mystery. Retailers want to solve that problem10 in order to ensure excellence at the point of experience. For the store, the mobile and RFID players have developed solutions that provide locating intelligence so shoppers can really enjoy their in-store experience—seeing, finding, sampling/ trying on and buying in a seamless way. Once store intelligence is as viable as web intelligence, retailers will have cross-channel visibility to plan where to put people, inventory, and overall investment.